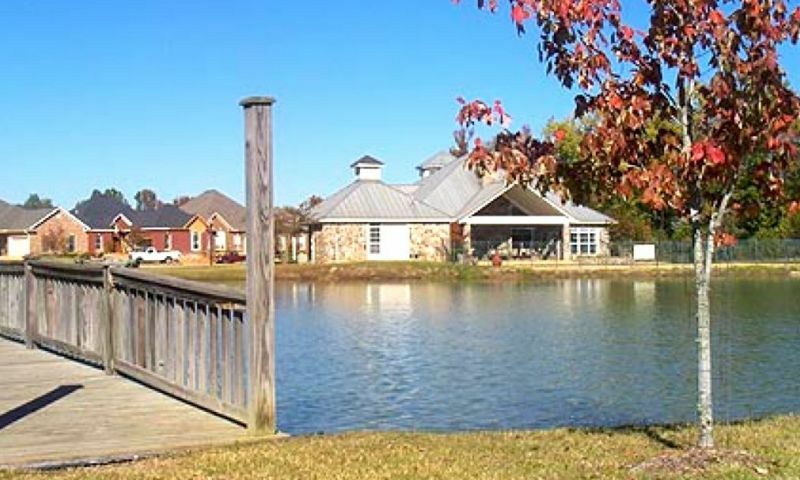 The Villages is an active lifestyle community in Tupelo, Mississippi. The Villages has a mixture of beautiful gated neighborhoods surrounded by lush landscaping, scenic lakes and a quiet country setting. With an inviting clubhouse that is the center of social interaction, residents get the resort-style feel combined with southern hospitality and charm unlike any other. Homebuyers also have a variety of floor plans within its six distinct neighborhoods featuring unique home designs. The central hub of physical and social activities is held at The Village Club. This 4,000 square-foot clubhouse features a variety of amenities that are sure to meet the needs of many adults and their active lifestyles. The Village Club is adorned with a wood-burning fireplace and has an exercise room equipped with weights and fitness machines to help keep residents in shape. Residents have access to a spacious banquet room where social events can be held as well as rented out for special occasions. A conference room is also available for small meetings. A catering kitchen and bar are handy when preparing a snack or drink for an event. The office center is available to residents for emailing, faxing, and copying purposes. The outdoor amenities include a covered porch and outdoor patio, which are great areas for relaxing or hanging out with neighbors. The swimming pool is another amenity that can help homeowners stay in shape or unwind after a long day. The walking and biking trails intertwine throughout the entire community, which allows residents to enjoy the outdoors and views of three scenic lakes that add natural beauty to The Villages. Premier Builders began construction of The Villages in 1998 and plans to build 389 residences. The Villages consists of six distinct gated neighborhoods, each with their own unique home designs. McClellen Place features single-family homes with 1,395 to over 1,700 square feet of living space. They have two or three bedrooms, two or two-and-a-half bathrooms, and an attached two-car garage. These homes are available as new construction or resale. Georgetown Village offers homes on a resale-only basis. These detached homes offer 1,440 to 2,467 square feet of living space with two or three bedrooms, two or two-and-a-half bathrooms, and a two-car garage. These homes feature New Orleans and Charleston-style home designs, private courtyards and rear garage entrances. Camellia Place offers smaller homes on a resale-only basis and features 1,510 to 1,783 square feet of living space. These single-family homes have two or three bedrooms, two bathrooms, and an attached two-car garage. Single-family homes in the Madison Square neighborhood have views of the Village Lake and are within walking distance to the clubhouse. These homes offer 1,634 to 2,696 square feet with three or four bedrooms, two to three bathrooms, and two-car garages. These homes are available as new construction or resale. Lexington Square offers spacious single-family homes that have 1,651 to 1,960 square feet of living space. They have two or three bedrooms, two or two-and-a-half bathrooms, and an attached two-car garage. Each home features a front-porch and an optional second-floor bonus room for additional space. These homes are available as new construction. Belle Harbour offers the largest homes within The Villages that range from 2,137 to 3,113 square feet. These single-family homes have three or four bedrooms, two-and-a-half or three-and-a-half bathrooms, and an attached two or two-and-a-half-car garage. All homes in Belle Harbour feature first-floor master suites, luxurious fixtures, high ceilings and gourmet kitchens. These homes are available as new construction. The Villages offers residents a socially invigorating lifestyle. Homeowners can participate in activities and classes such as card games, fitness classes, sewing classes, swimming and family and adult social events. Residents can relax on their own, mingle with neighbors in the clubhouse, or start a new club based on shared interests. Homeowners have more time to enjoy their own hobbies and interests thanks to the homeowners association (HOA). The affordable HOA fee includes exterior building maintenance and landscaping. Tupelo is located in the northeast corner of Mississippi. Residents have convenient access to Highways 45, 78 and the Natchez Trace Parkway for shopping, dining, and entertainment options within the area. There are plenty of attractions in Tupelo such as historic sites like the Elvis Presley Birthplace & Museum and Tupelo Automobile Museum as well as wildlife areas like Tupelo Buffalo Park and Ballard Park, which are all a short distance from The Villages. For farther travel and big-city fun, residents can visit Memphis, TN or Atlanta, GA with flights from Tupelo Regional Airport that are less than ten minutes away. With so much to do in and around Tupelo, MS, homeowners are sure to love all of the conveniences and amenities found in The Villages. The Village Club - 4,000 Sq. Ft. There are plenty of activities available in The Villages. Here is a sample of some of the clubs, activities and classes offered here. Camellia Place is an active adult community offering homes on a resale-only basis that feature 1,510 to 1,783 square feet of living space. These single-family homes have two or three bedrooms, two bathrooms, and an attached two-car garage. Single-family homes in the Madison Square neighborhood have views of the Village Lake and are within walking distance to the clubhouse. These homes offer 1,587 to 2,696 square feet with three or four bedrooms, two to three bathrooms, and two-car garages. These homes are available as new construction or resale. Lexington Square offers spacious single-family homes that have 1,651 to 1,960 square feet of living space. They have two or three bedrooms, two or two-and-a-half bathrooms, and an attached two-car garage. Each home features an optional second-floor bonus room for additional space. These homes are available as new construction. Belle Harbour offers comfortable and spacious living areas that have 2,137 to 3,113 square feet. These single-family homes have three or four bedrooms, two-and-a-half or three-and-a-half bathrooms, and an attached two or two-and-a-half-car garage. All homes in Belle Harbour feature first-floor master suites, luxurious fixtures, high ceilings and gourmet kitchens. These homes are available as new construction. Drove through this neighborhood looking at homes and was very surprised at how nice the community was. There is a separate section that is more attractive to retirees and then a very nice clubhouse in the middle of everything. Overall, liked the area and it's just around the corner from the birthplace of Elivs Presley. Who wouldn't want to live near that?! 55places.com is not affiliated with the developer(s) or homeowners association of The Villages. The information you submit is distributed to a 55places.com Partner Agent, who is a licensed real estate agent. The information regarding The Villages has not been verified or approved by the developer or homeowners association. Please verify all information prior to purchasing. 55places.com is not responsible for any errors regarding the information displayed on this website.